Was This A Valid Inventory Search? One exception to the search warrant requirement is for ‘inventory’ searches. If a person, like Jamie, is going to jail, officers are permitted to inventory that person’s personal belongings which are with them at the time of the arrest. The search is administrative rather than investigative, so a search warrant is not required. In this case, however, Jamie’s purse was not really with her at the time of the arrest. She was being taken to jail, but the purse was with her live-in boyfriend who could have taken it home, so there was no need for the officer to retrieve it and inventory it. Therefore, the search was not a valid inventory search, so it violated Jamie’s search and seizure rights. 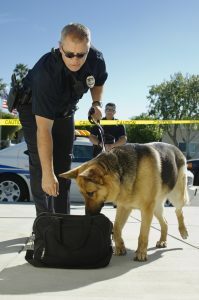 When there is a violation of a defendant’s search and seizure rights, the remedy typically is to exclude the seized evidence from the defendant’s trial. The exclusionary rule is designed to deter police from violating Constitutional rights. There are, however, exceptions to the exclusionary rule. The prosecution argued two exceptions applied in this case: (1) inevitable discovery; and (2) officer’s good faith. Should The Evidence Be Excluded From Trial? The ‘inevitable discovery’ rule states illegally obtained evidence may be admitted in trial if the prosecution establishes the evidence would have been inevitably discovered in the course of a lawful investigation. In this case, the Ohio Supreme Court concluded the contents of Jamie’s purse would not have been inevitably discovered because there was no investigative reason to seize and search the purse. The Court held the search violated Jamie’s rights because there was no search warrant, and it was not a valid inventory search. The court further held the evidence would not have been inevitably discovered, and the officer did not act in good faith. As a result, the Court excluded the evidence in the purse from Jamie’s trial. As a practical matter, the case will almost certainly be dismissed. Search and seizure law can be complex. In this case, the Ohio Supreme Court conducted a thorough analysis of the applicable nuances. The same type of thorough analysis should be applied by Ohio DUI / OVI lawyers when representing clients who have cases involving search and seizure issues.